Most clinicians are familiar with use of methylene blue for the treatment of methemoglobinemia, as a urinary analgesic, anti-infective, and anti-spasmodic agent, or for its use in endoscopy as a gastrointestinal dye, but this compound also has a role as a rescue antidote in life threatening poisonings causing refractory shock states and other shock states. Nitric Oxide plays an important role in the regulation of vascular tone. 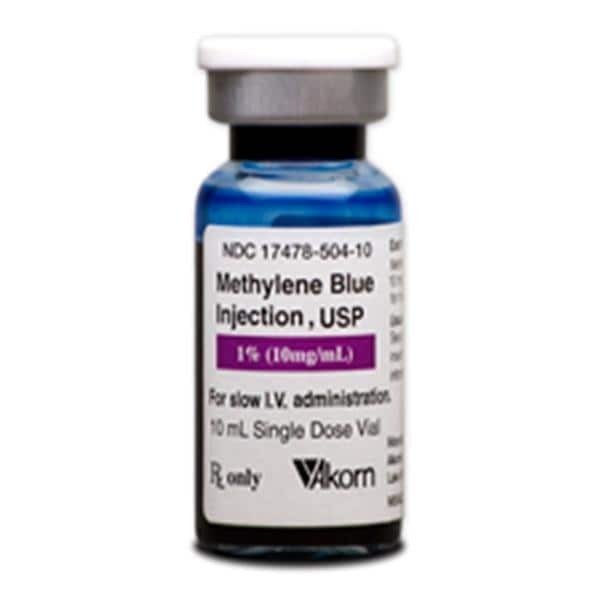 Metylene blue inhibits the NO-cGMP pathway which decreases vasodilitation and increases responsiveness to vasopressors. Several case reports document hemodynamic improvement in recalcitrant shock states form calcium channel and beta blockers despite multiple therapies including vasopressors, glucagon, high dose insulin, and fat emulsion therapy. Dosing is 1-2 mg/kg (0.1-0.2 ml/kg) of 1% solution given IV over 5 minutes folllowed by continuous infusion. Methylene blue should be considered when standard treatment of distributive shock fails. Methylene Blue for Distributive Shock: a Potential New Use of An Old Antidote. Jang DH, Nelson LS, Hoffman RS. J Med Toxicol. 2013;9(3):242-9. Methylene blue used in treatment of refractory shock resulting from drug poisoning. Fischer J. Taori G. et al. Clin Toxicol 2014 Jan;52(1) 63-65. Calcium channel antagonist and beta blocker overdoses: antidotes and adjunct therapies. Graudins A, Lee HM, Druda D. Br J Clin Pharmacol. 2016 Mar 81(3):453-61. A Review of Methylene Blue Treatment for Cardiovascular Collapse. Lo A, Jean CY, et al. Journal of Emerg Med. May 2014. Vol 46 (6): 670-679. A Systematic Analysis of methylene Blue for Drug-Induced Shock. Warrick BJ, Tataru AP, Smolinske S. Clin Toxicol 2016 Aug;54(7):547-55.